North Broad Street is turning into one of the most prosperous parts of Philadelphia, with new development occurring on almost every block between City Hall and Temple University. That stretch of Broad has a mix of historic buildings and parking lots. 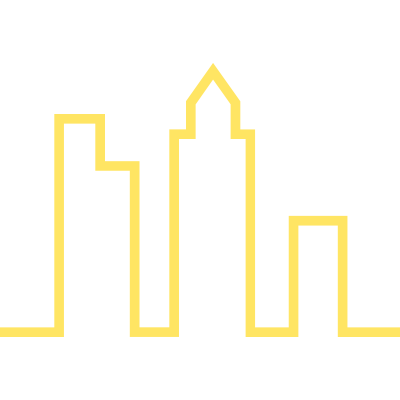 There are subway stations at Race Street, Spring Garden Street, Fairmount Avenue, and Girard Avenue. Many of the new developments are apartment buildings, which were not common on the stretch until recently. Currently, there are more than 1,000 rental apartment units occupied and nearly 1,500 new units either under construction, finishing up construction, or proposed along, or immediately adjacent to, North Broad Street from City Hall to Temple University, a couple miles to the north. Just north of City Hall, the Pennsylvania Convention Center has recently been expanded onto Broad Street, now covering six whole city blocks. It is now the largest convention center in the Northeastern United States and the number one convention center in the world for medical and biotech conventions. Adjacent to the convention center, at Broad and Arch Streets, is the 21-story former Liberty Title and Trust Building, now being renovated into an Aloft Hotel. The new Aloft Hotel will have 178 guest rooms and a restaurant, as well as, direct access into the convention center. Across the street, a former industrial, then government, building was renovated into the Fischer Building of the Academy of Fine Arts and between the Fischer Building and the landmark Academy of Fine Arts Museum is Lenfest Plaza, with a giant paint brush designed by Claes Oldenburg and the Grumman Greenhouse, an actual greenhouse in a former Air Force fighter jet. Next to the Fischer Building, at 142 North Broad, is a six-story 1920s-era parking garage, which is about to be renovated into an apartment building, with 101 units in ten stories, because four additional stories will be built on top. North of Vine Street is the Packard Motor Car Building. The Packard Motor Car Building, at 317 North Broad, was built in 1910 and was used for manufacturing the famous luxury automobiles and had a showroom in the lobby. The Packard Motor Car Building was converted into 151 rental apartments in the 1980s and now has studio apartments beginning at $1,570 per month, one-bedroom apartments beginning at $1,725 per month, and two-bedroom apartments beginning at $2,295 per month. Next to the Packard Motor Car Building is a new rehearsal space and school for the Pennsylvania Ballet and north of that cultural touchstone is the newly built Hanover North Broad buildings. Across the street is the former headquarters of the Philadelphia Inquirer and Daily News. Built in 1924, the roughly 25-story building is about to be converted into the city’s Police Headquarters. Hanover North Broad, which is at 322 North Broad, has two buildings on the southeast and southwest corners of Broad and Callowhill Streets, both replacing parking lots, and being developed by Hanover Company and Parkway Corporation. The building on the southeast corner will have 110 units and 6,000 square feet of retail space and the building on the southwest corner will have 229 units and 11,000 square feet of retail space. Hanover North Broad has two floor plans of studios starting at $1,815 per month, nine floor plans of one-bedroom units starting at $2,110 per month, eleven floor plans of two-bedroom units starting at $2,888 per month, and one floor plan of three-bedroom units renting for $3,755 per month. North of Hanover North Broad is the 511 North Broad Condominiums, the first and, so far, only major condo building on North Broad Street. 511 North Broad Street was an office building that was converted to condos about ten years ago, with several dozen condos at Broad and Spring Garden Streets. Across Broad Street, from 511 North Broad Condominiums, is Tower Place. Tower Place is a former state office building at 1400 Spring Garden Street, which has recently been converted into apartments by Tower Development. Tower Place has 204 units, and twelve different floor plans named after wealthy American families, with available one-bedrooms starting at 757 square feet and $1,720 per month and available two-bedrooms starting at 1,277 square feet and $2,604 per month. Eventually, Tower Place might expand with a wing next to 15th Street and, perhaps, a shopping center extending onto Broad and Spring Garden Streets. On the northwest corner of Broad and Spring Garden Streets is a parking lot formerly used by Ben Franklin High School. That lot was bought by Parkway Corporation recently, which is planning to build a large mixed-use development with two towers. One tower will be an 18-story office tower at the corner of Broad and Spring Garden, officially at 510 North Broad, and another tower will be a twelve story tower on Spring Garden, which will have office space and apartments. The exact number of apartments hasn’t been determined yet. The project will include retail on the first floors. This project hasn’t received any approvals yet by city agencies and the start date has not been determined yet, either. On the northeast corner of Broad and Spring Garden Streets is the former Thaddeus Stevens School, at 523 North Broad, which was later used as a School District administrative building and then was renovated into the Mural Lofts in 2015 by EBRM. Mural Lofts gets its name from the large mural facing Broad Street on the western facade of the building. Mural Lofts has 56 rental apartment units, with one-bedrooms starting at $1,275 per month and two-bedrooms starting at $2,200 per month. There are three floor plans for the one-bedrooms, ranging in size from 690 square feet to 707 square feet and two floor plans for the two-bedrooms, respectively 1,077 square feet and 1,381 square feet. The units still have the original woodwork and chalk boards from when it was used as a school. EBRM plans to add a small retail building at the corner of Broad and Spring Garden Streets. EBRM is, also, responsible for two rental communities on the west side of Broad Street just north of Spring Garden Streets. 600 North Broad was a former car showroom and a large warehouse on 15th Street that was renovated into 97 rental apartments in 2011. The former warehouse is at 1440 Mt. Vernon Street and used to be called the Biberman Building, but is now called 600 on Broad. It is managed by PMC Property Group, which states that one-bedroom units start at $1,395 per month and two-bedroom units start at $2,155 per month. There are three one-bedroom unit floor plans and two two-bedroom unit floor plans. To the north of 600 North Broad is Lofts640, at 640 North Broad Street. Lofts640 was originally known as the Mulford Building, named after a pharmaceutical manufacturer. That pharmaceutical manufacturer became famous in 1925, when it quickly manufactured medicine for a wintertime outbreak of diphtheria in Nome, Alaska. The winter weather made it impossible to transport the medicine by truck or train, so it was transported 650 miles by dogsled and became the inspiration for the annual Iditarod dogsled race, which commemorates the urgent and heroic rush to transport the Mulford Company’s medicine to those stricken with the disease. The Mulford Building was renovated into Lofts640 by EBRM about a decade ago, with 265 rental units. It was the first upscale apartment renovation on North Broad Street, north of Spring Garden Street. There are 91 studio units, 143 one-bedroom units, 4 one-bedroom plus den units, and 27 two-bedroom units. The current apartments feature 20 different floor plans as well as rooftop amenities, and the first floor has the popular restaurant, Osteria. A little further up, on the east side of Broad Street, is a former horse stable which is being converted into an apartment building at 631 North Broad Street. This building dates back to the nineteenth century and was most recently used by the Calderwood Gallery as a warehouse for art and furniture. It will soon have an addition in the back and the whole project will have 41 rental units and a retail space on the ground floor. It is currently under construction. Further up at 655 North Broad, at the corner of Broad and Wallace Streets, is a small building that currently has Santucci’s Pizza on the first floor. This building is slated to be expanded to be a five story building by the owners of Santucci’s. Santucci’s will remain on the first floor and there will be 18 rental units above. The apartments will have four studios, nine one-bedroom units, and five two-bedroom units. 655 North Broad Street has received a zoning variance by the Zoning Board of Adjustment and should begin construction soon. It will have a modern, colorful facade, with metal panels covering up the brick and the arches above the windows. Just to the north of 655 North Broad is the former Studebaker showroom. That building consists of a two-story building from the nineteenth century, on Broad Street, and a more modern addition on Ridge Avenue. For a long time, the Studebaker showroom building was used as a large overnight homeless shelter, but that shelter closed down as the city decided to move away from large overnight shelters for the homeless. The former Studebaker building is being converted into a coworking space by EBRM, called Divine Works. Divine Works will have a restaurant on the first floor, with outdoor seating out front. The renovation is doing the opposite of 655 North Broad and removing modern panels to reveal nineteenth century brickwork and arches above the windows. At the intersection of Broad Street, Fairmount Avenue, and Ridge Avenue is the landmark Divine Lorraine Hotel, at 699 North Broad Street. The twelve-story Divine Lorraine Hotel is perhaps the most famous landmark building on North Broad Street. It was originally built as the Lorraine Apartments back in 1894 and then converted to a luxury hotel. In the 1940s, it was purchased by the Divine Peace Mission and converted into a residence for church members and anyone willing to abide by the church’s code of conduct, which included separate rooms for men and women. The church vacated the building in 2003, and it changed ownership several times in the years after. One of those owners was Eric Blumenfeld, owner of EBRM, who has recently purchased it again and is almost done renovating it into 100 apartments and a small hotel in the annex building in the back. The first floor will have a restaurant and the basement will have a speakeasy-type restaurant and bar, based on the 1920s speakeasy that was there to avoid the authorities during Prohibition of alcohol. EBRM has renovated the facade to resemble the look it had in the 1890s and has rebuilt the landmark “Divine Lorraine Hotel” neon signs on top, which can now be seen from City Hall and Temple University at night. The apartments will mostly be one-bedroom units, but each floor will have two two-bedroom units. They will have GE stainless steel appliances and American Standard bathroom fixtures, with granite countertops and hardwood floors, and a combination washer/dryer in each unit. Each unit will have exposed brick, many which have tiny nooks that can be used to store books or other items. Many units will have wooden ledges along the brick walls and plenty of closet space. Some units have restored balconies outside, however, because of insurance concerns the balconies can’t be accessed by residents and will just be ornamental. Each floor will have one unit designed for the disabled. One bedroom units will range from 555 to 683 square feet, except for the two penthouses which will both be about 1,000 square feet. The two bedroom units will range from 1,081 to 1,282 square feet. Rents for the one-bedroom units, on floors two through four, range from $1,400 to $1,770 per month and the rents for the two-bedroom units, on floors two through four, range from $2,550 to $2,810 per month. 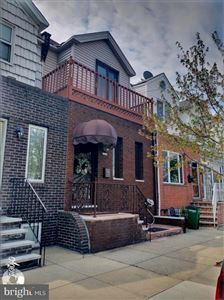 The rents for one-bedrooms, on floors five through eight, range from $1,635 to $1,845 per month and the rents for two-bedrooms, on floors five through eight, range from $2,735 to $3,160 per month. The penthouses will rent for $1,575 per month and $1,875 per month. Parking spaces will be available in a surface parking lot behind the PNC Bank across the street and will cost $150 per month. Tenants will be able to receive hotel amenities, such as room service; house cleaning; dry cleaning; and concierge service, at an additional cost for each service, but no monthly flat fee. Next to the Divine Lorraine Hotel is a large empty lot along Fairmount Avenue and extending to 13th Street. This lot, at 1300 Fairmount Avenue, is owned by Procida Funding and RAL Development and will be developed into a massive mixed-use development, with 486 rental apartments and retail on the first floor. The retail space should include a neighborhood supermarket. There will be additional townhouse units on 13th Street, presumably for rent, too. 1300 Fairmount has received approval from city agencies, including review by the Civic Design Review board and approval by the Streets Department to strike Potts Street and part of Melon Street, and should begin construction of the first phase within the next year. The first phase will likely include the retail and the west wing of the apartment tower, which should be 15 stories tall. The second phase will add the east wing of the apartment tower, which will be 21 stories tall. Just to the south of 1300 Fairmount and Divine Lorraine are two empty lots along Ridge Avenue and small Park Avenue. Those lots, at 662 North Park Avenue, are slated to be developed into two apartment buildings with 25 units each, for a total of 50 rental units. The plans call for 3,000 square feet of retail space on Ridge and a facade that resembles the Packard Building. 662 North Park Avenue recently went in front of the Zoning Board of Adjustment for variances for size, height, and retail use, but was denied after neighborhood residents complained about the lack of parking. The developers are considering putting parking in the basement, where they had planned to put a community room. After negotiating some more with the near neighbors, they plan to go back to the Zoning Board soon to seek their variances so that they can proceed with construction soon. Up at Broad and Poplar Streets is the vacant Metropolitan Opera House. The Metropolitan Opera House was built in 1908 by the Hammerstein theatrical family. It was used as an opera house for a while, then as a Vaudeville theatre and later a movie theatre and a church. It is, now, owned by Eric Blumenfeld who intends to start renovating it, this June, into a landmark concert hall, with upwards of 4,000 seats. 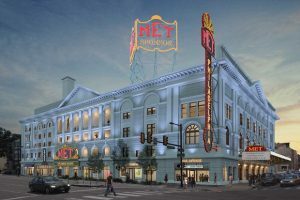 Blumenfeld and EBRM plan to renovate the historic, but damaged, facade and add old-fashioned looking neon signs and a modern video screen on the exterior to announce the upcoming shows. The Broad Street side will, also, have a restaurant on the first floor. Just north of Poplar Street and south of Girard Avenue, at 906 North Broad, is a one-story building that is slated to have a large expansion on top. The expansion will add five more floors and bring 100 apartments to the site, and will keep the three retail spaces. This development is to be heard by the Zoning Board of Adjustment soon, and will likely have to be heard by the Civic Design Review board before they can begin construction. Just north of Girard Avenue is 1220 North Broad Street, a 1960s-era highrise apartment building, with 300 units, that’s recently been renovated. 1220 North Broad Street has retail spaces on the ground floor and facade lighting on the Broad Street side. 1220 North Broad has studios for $845 unfurnished and $1,020 furnished per month, one-bedroom units for $900 unfurnished and $1,100 furnished per month, two-bedroom plus den units for $1,100 unfurnished and $1,250 furnished per month, two-bedroom junior units for $1,225 unfurnished and $1,475 furnished per month, and two-bedroom units for $1,425 unfurnished and $1,675 furnished per month. 1220 North Broad, also, has furnished hospitality suites, with one-bedroom units for $400 per week and $1,500 per month and two-bedroom units for $500 per week and $2,000 per month. A bit further up, and just south of Temple University is the landmark Freedom Theatre, in the former home of famous nineteenth century actor Edwin Forrest. In between the Freedom Theatre and the former Blue Horizon boxing venue is a vacant lot at 1324 North Broad Street. A new highrise apartment tower, designed by Cecil Baker Architects, is planned for the site. 1324 North Broad Street will be 17 stories tall and have 180 rental units. It will, also, have a bi-level restaurant on the first floor. There will be studios, one-bedroom, two-bedroom, and three-bedroom units. There will be a courtyard and a rain garden. All these developments are remaking North Broad Street into one of the most thriving and exciting areas of Philadelphia. North Broad Street is quickly becoming a popular and fashionable location for apartment dwellers and developers, alike.